When our family decided to pull our oldest daughter out of kindergarten and bring her home, we only knew two other homeschooling families. These two families were very different in their homeschooling styles, and yet on one thing they were in passionate agreement: a well-rounded education involves reading, reading and more reading. More importantly, it involved sharing good books as a family. Having grown up in a family that never read together at all, this was a foreign concept. I’m sure that my parents read story books to me when I was small and then passed the torch when I learned to read at the tender age of four. If I had never met these two women, who shared their contagious joy of family reading, I would have missed out on one of the best experiences I could have ever shared with my children. When we plunged into the homeschooling world, along with the two established homeschool families, two other families were also just getting started and so we started a little support group. These early meetings mostly consisted of getting together and asking lots and lots of questions of the veteran moms. We discussed the legal requirements in our state, how to navigate the yearly testing mandate, what curriculum to use, how to pull it all off on a shoestring, etc. 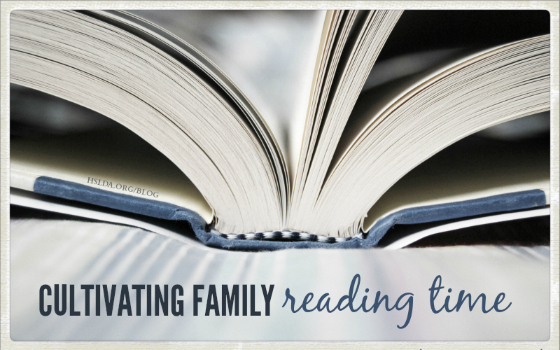 Instead of feeling encouraged, these conversations often left me feeling frustrated and overwhelmed, until my friend said very simply to me, “You’ll never do wrong by your kids if you spend time reading with them. Just read.” The beautiful simplicity was not lost on me, and I quickly discovered the consistent joy of reading aloud with my family. If the kids were sick and couldn’t concentrate on math, we read. If we were waiting in the doctor’s office for an appointment, we read. We listened to books on tape in the car, we had evening storytime, and we took turns reading to each other for an hour in the afternoon. Reading in and of itself is a definite pleasure. I wish I had made more time for it personally. There is a quiet joy in meeting new friends, sharing their lives and understanding more about you in the process of the slowly unfolding stories a good book shares together as a family. Better than that, when in our frenzied, hurried, busy lives, when we took time to just sit quietly snuggled up on the sofa or piled all together in bed to share stories, we created family memories that last a lifetime. Those stories became a part of our family culture and one of the best connections I could have made with my children. Over the years our family read many missionary biographies. One of our favorites was Torches of Joy about a missionary family in Papua New Guinea. When the kids were small, we really enjoyed the “Heroes Then and Now” Series by Geoff and Janet Benge. We read stories that brought us closer to World War I, like House of Sixty Fathers. We have listened to many books on tape, such as the one we heard in its entirety on a long trip to the Outer Banks in NC with two friends in tow. The van was full of teenagers and all five sat spellbound – not talking or sleeping – all captivated on the entire trip by an end of the world story, “Z” is for Zachariah. Another great book that stands out is Homesick by Jean Fritz, a story about growing up as a missionary kid in China. Her descriptive writing about the culture, the people, long voyages in boats, and riding in a rickshaw will make you feel as if you are there. Forever in my memory, I know exactly where we were in the car when my daughter realized how the Diary of Anne Frank ended and we grieved the realities of the holocaust together. I hope this inspires you to share good books with your family and add a little sweetness to your lives! Photo Credit: First photo by Charity Klicka; second photo via Pixabay, edited by Charity Klicka.